This is the area on the SW side of Highway 82, with interesting features, cornices, and couliors. There are some mellower lines that go back down to the valley, but this will also give you access to 4th of July bowl, on the West side of the pass. From the parking lot at the top of the pass, where the elevation sign and the bathroom is, you head SW up the lower angle field, following the continental divide. 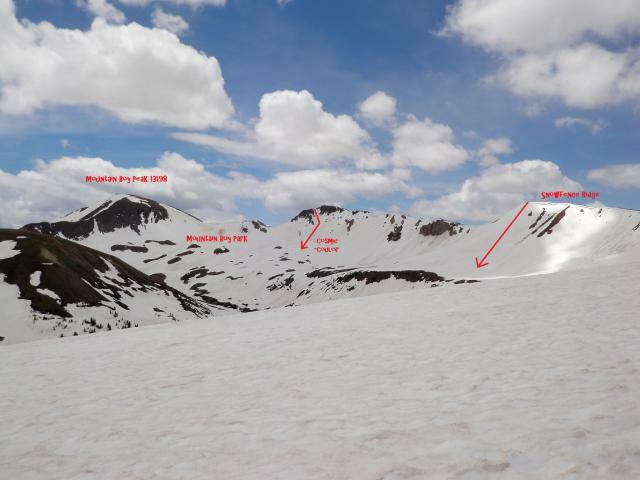 There is a very prominent ridge that goes SW to S and then comes back up towards the E. Coming from Twin Lakes, it will be on your left, coming from Aspen, it will be on your right. Road is closed during the Winter. There are some great camping spots, including Weller Campground, Lincoln Gulch Campground, Parry Peak, and others along Highway 82. Getting up here in the winter does not allow for vehicles to pass, as the highway is closed. In the summer, look out for traffic and bicyclists.